Rancho Cucamonga, CA - The Los Angeles Dodgers have released a preliminary roster for the Rancho Cucamonga Quakes, three days in advance of the team's California League opener in Visalia. A total of 16 former Quakes will return to Rancho Cucamonga to start the 2018 campaign, including 12 of the 13 pitchers on the roster. Jordan Sheffield and Tony Gonsolin, ranked 18th and 24th in the Dodgers' system, respectively by MLBPipeline.com, return to the Quakes to help anchor the rotation. Former Quakes Dean Kremer, Chris Mathewson and Andrew Sopko will also pitch out of the rotation, along with newcomer Imani Abdullah, who's ranked 19th by MLBPipeline. The bullpen is made up entirely of former Quakes, with Stetson Allie, Isaac Anderson, Parker Curry, Andrew Istler, Nolan Long, Ryan Moseley and Jason Richman making up the relief core. Five position players are rated within MLBPipeline's rankings, with outfielder Jeren Kendall (#7) leading the way, along with infielder Gavin Lux (#13), both of which are former first-round draft picks. Infielder Cristian Santana (#14), who saw time with the Quakes in the playoffs last year, catcher Connor Wong (#15) and outfielder Donovan Casey (#30) are the other top-rated prospects on the Rancho roster. 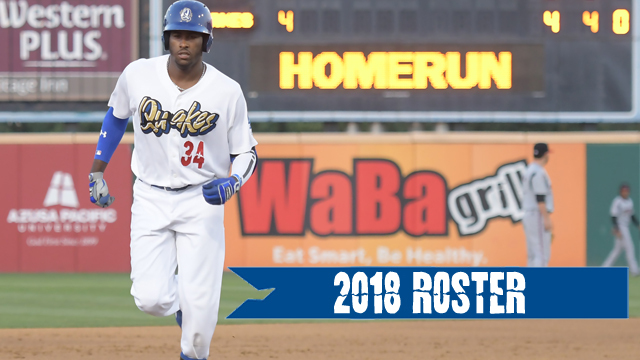 California League 2017 All-Star Ibandel Isabel, who mashed 28 home runs for last year's club, returns to the Quakes for a second year. He'll be joined by returning infielder Omar Estevez and outfielder Logan Landon. Other first-year Quakes include catchers Steve Berman and Hamlet Marte, infielder Rylan Bannon and outfielders Saige Jenco and Cody Thomas. The regular season roster will be finalized prior to Thursday night's Opener in Visalia. Thursday's opener can be heard live from Recreation Park in Visalia, by tuning into Fox Sports AM 1350 or by downloading the iHeartRadio app on your smart phone. All regular season games can also be heard on the Tune-In Radio app. The Quakes' home-opener at LoanMart Field will be the following Thursday, April 12th, as they host the Inland Empire 66ers in the first game of a four-game home stand. Opening Night will feature a spectacular post-game Fireworks Display and everyone that comes through the gates will also receive a 2018 Quakes Magnet Schedule, thanks to Allstar KIA. Thursday is also a Thirsty Thursday, as fans can enjoy $2 Pepsi products, $3 domestic 16-oz drafts and $4 16-oz premium drafts, wine, champagne and margaritas. Individual tickets, as well as full-season and mini-season tickets are now on sale by calling (909) 481-5000 or online at rcquakes.com. We hope to see you at LoanMart Field...Go Quakes!